For further information on the above job please see the source or contact the employer directly. Purpose of the job: The Administration & HR Support Officer will assist the CEO with administrative tasks related to the management of Vanuatu Red Cross Society and will work closely with the HR/Admin Officer to support HR administration requirements. Founded in 1982, Vanuatu Red Cross Society (VRCS) is a major stakeholder in the humanitarian system. The Society is recognized by the Government as auxiliary to the public authorities in the humanitarian field in accordance with the provisions of the First Geneva Convention. The organization is also one member of the National Disaster Committee. VRCS has identified Disaster Management and Disaster Preparedness as one of its main areas of intervention with a particular focus on community based disaster preparedness. It also implements a Health Program, whose main components are First Aid and Hygiene Promotion. The organization also encourages Youth participation and promotes the International Humanitarian Law. VRCS has branches in 6 different provinces and numerous sub-branches. It can also rely on a solid network of trained volunteers all over the country. Around 30 staff members are currently working at HQ in Efate, while around 20 are working in the other islands. • Ensures effective and efficient filing systems are in place and files all information accordingly. • Protects operations by maintaining confidentiality of information. • Drafts letters and documents as requested by the CEO. • Other administrative duties as required. • Assists in the development of HR administrative processes. • Assists in the management of VRCS recruitment processes. • Maintains CEO's appointment schedule by planning and scheduling meetings, conferences, teleconferences, and travel. • Conserves CEO's time by reading, researching, and routing correspondence; collecting and analyzing information; initiating telecommunications. • Welcomes guests by greeting them, in person or on the telephone; answering or directing inquiries. • Ensures operation of equipment by completing preventive maintenance requirements; following manufacturer's instructions; troubleshooting malfunctions; calling for repairs; maintaining equipment inventories; evaluating new equipment and techniques. • Maintains office supplies inventory by checking stock to determine inventory level; anticipating needed supplies; placing orders for supplies; verifying receipt of supplies. • Experience working in HR administration (highly regarded). 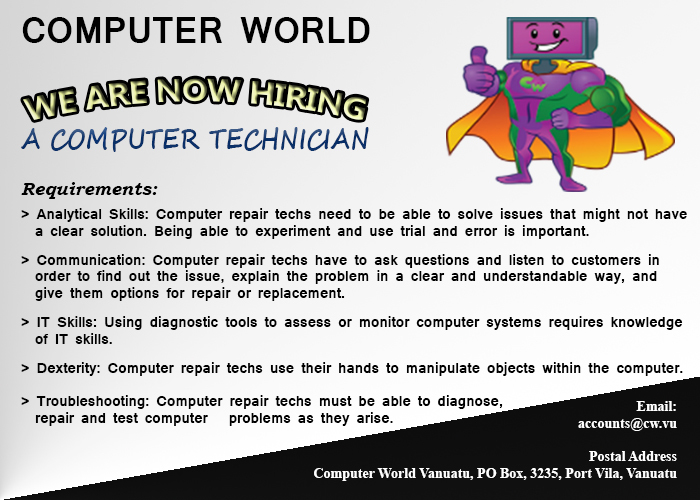 Computer World is currently seeking a suitable candidate to fill in the position of Computer Technician in order to provide quality of services to the clients. > Analytical Skills: Computer repair techs need to be able to solve issues that might not have a clear solution. Being able to experiment and use trial and error is important. > Communication: Computer repair techs have to ask questions and listen to customers in order to find out the issue, explain the problem in a clear and understandable way, and give them options for repair or replacement. > IT Skills: Using diagnostic tools to assess or monitor computer systems requires knowledge of IT skills. > Dexterity: Computer repair techs use their hands to manipulate objects within the computer. > Troubleshooting: must be able to diagnose, repair and test computer problems as they arise. > Work with colleagues (e.g., other computer repair and maintenance technicians) to resolve computer-related problems (troubleshooting), Open-Minded, well organized & flexible. > Ability to work under minimal supervision. > Trustworthy, self-motivated, with good communication skills and a fast learner. > Must be able to speak in English and Bislama. French is an advantage. Good remuneration depending on the level of qualifications and experiences. All interested applicants must send their job application by email or kindly drop your application at the given address. All applicant should send a Cover Letter, a CV (must be in detail), Qualifications and References. (c) wokikik. Simple theme. Powered by Blogger. We try to ensure information on this site is accurate but errors do occur - especially spelling errors! Please check the original sources for full details of any jobs before applying. If you find any errors please let us know and we will correct them.